Welcome to another Monday, are you ready to make shift happen? P.S. If you’re new to Mindshift Mondays, you can read the back story here. #MindshiftMonday: Do Your Life… Your Way! | What a week this was right? Eclipse energy, mercury retrograde, planetary shifts… What happens around us affects what happens within us and vice versa. When we fall out of alignment it’s easy to get carried away and influenced by those around us. I found myself looking for answers this last week. I asked… I asked friends, family, and strangers for answers to my questions. And answers I got. Answers that only made me ask more questions. The possibilities all sounded so good, which one was the right one? What does the right one even look like, feel like? I stopped asking outside and asked within. And just like that the answer came bubbling up. The right answer for me. My #hellyes as my dear friend @patbailey says. The answer that comes to you may not be the one that everyone agrees with, in fact more often than not, you’re answer leaves you feeling alone and uncomfortable… but in that discomfort is a new possibility. This week do your life… your way and make shift happen! 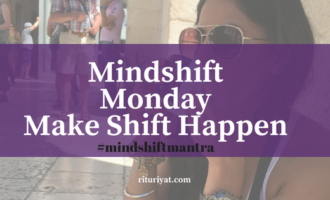 Share your risks and shifts this week on instagram, tag me livingritu and use the hashtag #mindshiftmantra and #mindshiftmonday to share your story.